In the winter of 1929, the town of Kotsmine Hills was snowed in. A mysterious fire broke out and quickly spread through the town. Trapped between a wall of snow and a wall of fire, many people lost their lives. Since that day, those spirits have been restless and seek peace. 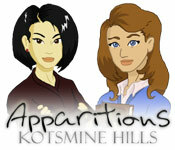 Join The Atlantic Paranormal Society and Peter Wren Paranormal Agency to investigate the town in Apparations – Kotsmine Hills, a ghostly Hidden Object game. When the ghost of the beautiful Diane de Poitiers appears in front of you, you are transported back in time in Amulet of Time: Shadow of la Rochelle!